Registration processes to get the status of importer in Argentina. How to get import licence in Argentina? 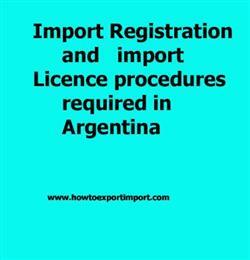 What are the procedures for registration as an importer in Argentina? How to start an import business in Argentina? What are the certification formalities to import to Argentina? This post explains about import registration procedures to be obtained from Argentina government authority for importation to Argentina. Those who want to import or export from Argentina must be registered as a taxpayer with the Federal Revenue Service. Individuals or organizations that wants to import or export merchandise from or into the nation must be enrolled in the Importers and Exporters' Registry before the Customs Service. Those importers or exporters that only wish to make isolated or occasional transactions don’t have to conform to the registration prerequisites, they can just request authorisation from the Customs Service. This information is about import licensing procedures to import goods to Argentina. If you have to add more information about import permit and registration required to import goods to Argentina, share below your thoughts. Registration needed to import to ROSARIO. How can I register to import in SAN PEDRO. What Licence requited to import in USHUAIA. What should I do to import goods in Buenos Aires. Import registration procedures required in BLANKA. Import Licence process in BAHIA . Process to import to BUENOS AIRES. Requirements of registration to import to CORDOBA. Registration requirements in MENDOZA to import. Mandatory process need to complete import in Mendoza. First permission required to import in Puerto Iguazú. How can I start import business Resistencia?. How to begin import trade in Río Gallegos? Permission to initiate to import in San Carlos de Bariloche. The way to get registration to import in Ushuaia. How to get import licence in Buenos Aires. Procedure to get registration to import in Córdoba.